Nothing sets coaches’ teeth on edge (or maybe just this coach’s teeth on edge) like comments and complaints about music. (Come to think about it, what does “teeth on edge” even mean?) Even more so than when someone pulls a big “Chalk LeBron,” I see red when I play some band or song I like, only to have a member go, “Hey, can you play some good music?”, like that’s a genre or maybe a greatest hits album released by That Cool Band Everyone in the World Likes. Music is incredibly subjective– almost anything Person A loves is bound to be hated by Person B. Add into it some other pitfalls I’ll discuss and there are times I’d rather just work out in silence, or that I had a pro DJ chained to one of my Assault Bikes permanently. I’d feed him, I swear. Don’t Get Too Far Out– The first gym I worked at was owned by the emitable David Osorio who loved a genre of music alternately referred to as doom metal or stoner rock, and specifically a band called Sleep. While I’ve come to have a special place in my heart for Sleep (and the plight of the Weedians), the title song from their album Dopesmoker is 63 minutes long. Yes, one hour long blast of sludgy, dirgy doom metal. After a few times trying to play it for group classes, Capt. Osorio wised up and it became reserved for coaches training sessions only. Humans tend to like things they are familiar with and the third round of Helen is probably the wrong time to try and introduce a member to the new Brazilo-Nordic Jazz Metal band you love. Stick to stuff that played on a radio, any radio, at some point in history. Keep it (Relatively) Clean– You’re running a business, try and be professional. Despite Tupac’s Hit ‘em Up being both a song of my youth and statement of my world philosophy, it’s not really group class material. While I think a few profanities are fine, there’s a limit. Hip-hop especially tends to use a few “no-no words” as punctuation- my general rule are if they pop up here and there and you almost miss them sometimes you’re probably ok, but if they are repeated incessantly (like as a chorus! ), are shouted or highlighted, or otherwise breach the stream of your consciousness enough that you go “wow, he sure is saying &#$*! a whole lot,” you should probably change it. 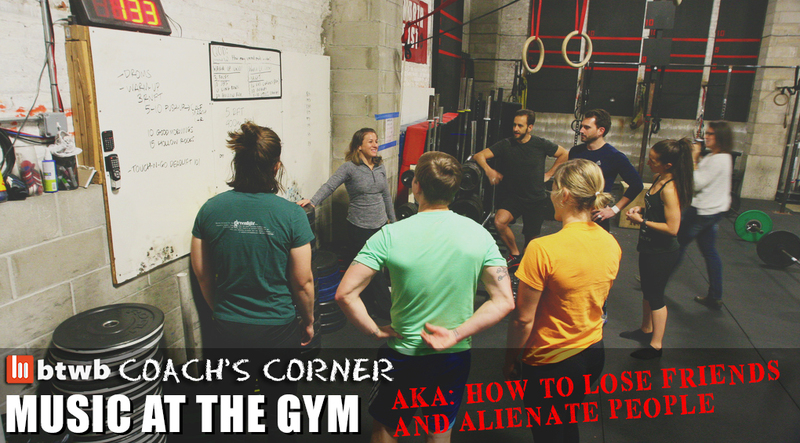 I Am The Captain Now: While I don’t think there’s written rules about this, nearly every gym I’ve been to and every coach agrees: members don’t touch the music. I don’t care if you’re DJ Tiesto secretly sneaking in a WOD while on break from your residency in Ibizththza, the coach is in charge of the music. Coaches, don’t abuse this dynamic- just because you love Transylvanian Xylophone Trance doesn’t mean your members do, so try and take their tastes into account. I will often ask a member what they’d like to hear, especially if it’s their birthday or they just gave me $5 or something like that. This even goes for other coaches who aren’t coaching that specific class- touch the music and prepare to catch a dumbbell in the neck. Playlists: Some coaches and members do a great job of building playlists and don’t be afraid to lean on them. Streaming radio services do a great job but A) they get repetitive and B) sometimes they throw a real curveball in there. Something someone actually curated will always be better. I’ve long had a dream of a shared playlist that all the members of a gym have access to- if enough people with diverse enough tastes drop their tunes onto it everything should balance out. If anyone knows how to do that let me know!